My father had an expression he often used when the phones were quiet and business was snoozing, “It’s time to start ‘dogging. '” He meant it was time to get on the phone and start connecting with people. Time to make something happen. Lately, I’ve started “dogging” again and the cool thing is that it’s working better than the Internet, prospecting, or that old stand-by, “hoping for something good to happen.” Besides making some deals, I’ve learned stuff by talking to clients or “would be” clients. Here are a few nuggets I’ve learned recently. There is some really terrific technology out there in the metal turning sphere and some of my clients are taking advantage in a big way. I have one client who sees the new technology from Index of Germany as his “unfair advantage.” He has several large diameter Index multi-spindles he bought new over the last few years. Around IMTS he placed orders for four 22mm Indexes for $9 million. He is quite confident this gamble on the most sophisticated turning equipment on the market will pay off big for him. He does not have a guaranteed contract to keep the machines busy, but he believes in himself and believes in the Index advantage enough to commit the investment. This guy has seen his old standby equipment of Brown & Sharpes and Davenports become obsolete with Chinese competition. His answer is to plunk down $9 million on Indexes for his company, which is doing $30 million a year in sales. Not far from away from the Index believer is another independent thinking entrepreneur who had followed a similar path of heavy capital investment to stay ahead of the crowd, but now he is changing course to play “small ball.” He heard about a failing screw machine firm, picked up the building for a song and then began buying old 7/16” 6-spindle National Acmes for a $1000 a piece. He refurbished the machines, bought top of the line tooling and accessories, and hired trainees at a low hourly rate. He started selling time on the old cheap multis for a third of what he had been charging at his original factory running the modern expensive equipment. Now he is making good money. He can sell his services cheaply enough to undercut Far-Eastern suppliers. He can even solicit work from other screw machine houses. A few other tidbits from around the country. Business is very good – except where is isn’t. The Oil Patch all of a sudden has heartburn. Business was fabulous for the last four years as the shale boom accelerated, and then suddenly the price of crude oil started to plummet. The Saudis, for internal political reasons and business necessity, raised their output just as the U.S. reached self-sufficiency in oil. The oil sands region in Alberta was hitting its stride even without the Keystone pipeline. Europe was in recession and the Russians had to sell oil to keep their economy afloat and Putin’s ambitions alive. Suddenly we now have $3 gasoline in America. Most of the rigs in the U.S. are still in use but this trend is not your friend if you are making stuff for oil and gas. And then there are the farmers who stopped buying tractors when corn and soybean prices fell into the furrows. The $8 corn of the ethanol boom is now under $4 a bushel. The harvest this year and last was epic, but just like in oil, too much is not always a good thing. For the firms doing Agriculture related work, especially in the Midwest, times are tough. What I’ve learned by getting back on the phones and off the email opium is that contrary to popular opinion, decision makers will actually talk to you if you are interesting and a good listener. And there is a lot to be gained by spending an hour a day doggedly dogging on the phone. 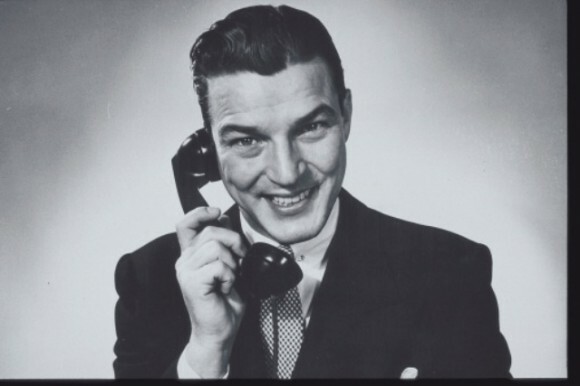 Question: Do you prefer dealing with people on the phone or via email? Honestly it depends on the nature of the communication. I do like to have some phone contact with a customer at least initially to build a relationship. I also like a phone call when someone is inquiring about buying a machine from us so that I can get a feel for which of our machines would be right for that customer. I find it’s just easier to find out what they’re doing and build off of previous questions and information over the phone than waiting for e-mail responses. For other communications it can sometimes be easier to use e-mail. The benefit of an e-mail is having the time to come up with a measured response or correspondence and read over it a few times to make sure you’ve delivered your message in a clear manner. It’s also good for quoting machinery as I can provide links to pages on our website, attach pictures and attach video footage. I must admit that I started to become too reliant on emails and realize I have much better success when I talk to people. Unfortunately verbal communications is becoming a lost art and I was losing that avenue of communication and am glad that I am trying to remedy it before it gets too late. I also find if you email someone it is easier for them to say they never recieved the email where as if you call there is some sort of proof. If he is undercutting Far-Eastern suppliers then he is not making good money. Unless you call selling chips to be your profit center. How about this guy is part of the problem not the found a better way guy, paying low wages and undercutting prices, now that’s something to pat him on the back about. As Iowa goes, so goes the Ag markets, Iowa had a record setting year, near perfect growing conditions, best year in 30 years, or so say the old timers. Experts claimed corn would never go below $5 a bushel again… Corn was less than $3.00 about a month ago, “up” to $3.57 now, going to be some farms for sale in Iowa next year… Just hope some young guys and gals get the chance to buy them and the dang investors stay the heck out ! Just todays thoughts from the tractor seat. Mostly email. I like to have a record of each conversation. A higher-up at one of my customers just called to find out why their order wasn’t ready. Informed her that I told their buyer back in July we could not meet the delivery date they wanted, it wasn’t what we quoted. She did not know that. I have it in an email. Also like to call customers just to see how things are going. But during the conversation if any questions pertaining to price, delivery, lead-time etc. I tell them to send me an email. I, too, like to have a record but it is nice to actually chat. Emails can’t deal, in real time, with a conversation that changes direction. So what I do is finish the phone call then, if needed, email the person back with any bullet points or promises so there is a record in case it’s needed. Not so much how I like to communicate with our customers as how they like to communicate with us – many of our USA customers are in the dark ages on email – the older group in particular — whereas the South American younger set are strictly email. My pattern is to respond the way they communicate with me – and I do push to move my detailed communication to the email format. I make efforts to back up my phone calls with email and ask for confirmation – that I sometimes never get. My wife started the testing stuff because of the kids and now I almost never talk to her !? Sometimes it works better and sometimes not ! Your father was clearly a smart businessman. I am always amazed at the opportunities that open up when we spend quality time talking about our customers business with them. It is very easy to get caught up in the day to day demands of getting the jobs done on time, but those personal conversations with our customers are what keeps our sales efforts and results on the right track. i know i email way too much thanks for the friendly reminder to get on the horn or show up in person . . . “old fashioned” but works well. Agree on younger folks – mostly prefer “electronic” means – couple more years and i will be a senior at the casino – that age keeps coming down . . . Both, e-mail for items that need to be documented, phone for personal connection. Get better response if there is some personal tie.